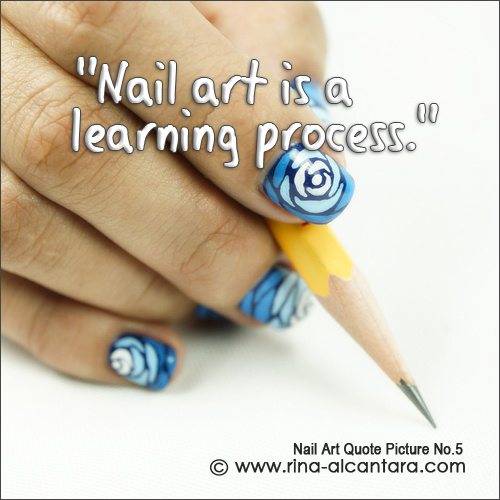 "Nail art is a learning process." I look at nail art designing like going to school because I think it is a learning process. Would you agree? A nail artist can only discover his/her personal style and the techniques that would work for him/her in time, through experience. Honestly, I am still learning a lot as I do nail art. I hope nail art beginners would realize this and be more patient when they stumble into difficulties along the way. Like going to school, everyone starts from first grade. And even after graduation, we don't stop learning to better ourselves. The same holds true with nail art. Nail art used for photo is Blue Wave.